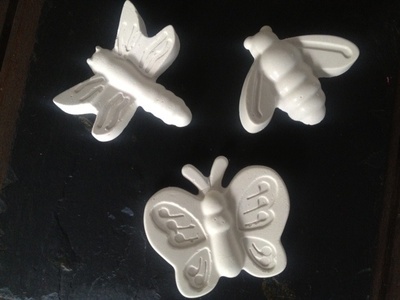 Casting plaster of Paris in a silicone baking mold is surprisingly easy. The casting process is a fun activity in itself. 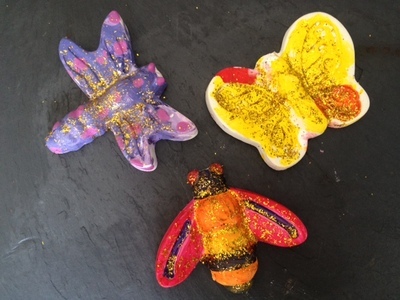 Children can also enjoy decorating the items once they have dried. Decorating plaster creatures would be a great activity for a birthday party. If you're having a theme, you could choose a silicone baking mold to match your theme and make up your plaster items in advance, ready to paint. A big bag of plaster costs just a few dollars from a discount craft shop so each creature costs very little. The silicone mold is not damaged in the process and can be washed and reused. Make up the plaster according to the manufacturer's instructions. We used 1/2 cup of plaster and added it to 1/4 cup of water, stirring well until we had no lumps. Be careful not to get plaster on to your skin and make sure you don't inhale any plaster dust. Don't wash plaster down the sink as it can harden in the pipework. It may be easier to prepare it in a disposable plastic cup or tub which you can just throw away afterwards. When dry, remove the plaster creatures from the molds. Paint with acrylic paint. You could add glitter or stick on googly eyes or other gems and embellishments. You could also varnish your finished creatures.